The most powerful officials in Norway’s labour market gathered this week and agreed that “moderation” will continue to be the buzzword in wage and salary talks this spring. Executive pay, meanwhile, and even the salaries of some political leaders have risen to a level that’s anything but moderate, by Norwegian standards. Top business leaders in Norway are now paid an average of 11 times the so-called “ordinary” Norwegian salary of NOK 510,000 (USD 63,000) a year. The average executive salary in Norway, according to those on magazine Kapital’s list of the country’s 100 biggest companies, is NOK 5.8 million excluding pension contributions and stock options. The highest reported salary, NOK 19 million (USD 2.3 million), was 36 times an ordinary salary, and attached to the CEO of offshore firm Subsea 7, Jean Cahuzav. State statistics bureau SSB (Statistics Norway) has also recently reported that the salaries of those earning the most in Norway have risen 46 percent over the past 10 years. Those in the lowest income groups, by comparison, have had raises of 24 percent over the same period. While executive pay in Norway generally remains much lower than it is in countries like the US and the UK, there also have been reports recently of extraordinary earnings of some Norwegian executives. Newspaper Dagens Næringsliv (DN) reported on Tuesday, for example, that the CEO and main owner of Oslo-based securities firm Pareto, Svein Støle, has earned nearly NOK 1 billion over the past two years. Støle himself acknowledges that “it was difficult for us and many others here in the country with the low oil price, but it went up, and all in all, I’m very proud of the results last year.” Pareto remained profitable and DN reported that Støle’s 100 percent ownership of Pareto’s parent company left him with gains and dividends of NOK 997 million. Among salaried Norwegians, one who’s CEO of the international oil service company Schlumberger earned in a day what many others still earn in a year. During a time when Schlumberger laid off thousands of workers, DN reported over the weekend that Paal Kibsgaard, originally from Ålesund, has earned NOK 650 million over the past four years based on his total compensation of USD 78.2 million. His annual compensation has fallen, from USD 22.8 million in 2013 to USD 18.6 million last year, but his 2016 earnings at current exchange rates still amounted to NOK 155 million, or, according to DN‘s calculations, NOK 425,000 per day. Kibsgaard’s contracted cash salary was USD 2 million. In addition came a bonus of USD 2.8 million (also less than in 2015) plus compensation in the form of shares, pension, incentives and benefits. The 49-year-old Kibsgaard’s company wrote in filings with the USD Securities and Exchange Commission (SEC) that Schlumberger “delivered strong economic results” despite the industry downturn that began in 2014, noting that at the same time the company was “forced to reduce the number of our employees by 50,000.” Such high executive pay in Norway is all but unheard of, but CEOs at Norwegian companies also continue to earn multi-million-kroner salaries at a time of layoffs and virtual pay freezes for those who survive staff cutbacks. The salaries of even some political officials, meanwhile, have raised eyebrows lately. Newspaper Aftenposten reported over the weekend that some leaders of the County Councils (fylkesordfører) around the country earn nearly as much or even more than government ministers, much less “ordinary” workers. The County Council leader in Telemark, Sven Tore Løkslid of the Labour Party, topped the list with a salary of NOK 1.24 million last year (USD 150,000), while his counterparts and party fellows in Møre og Romsdal and Hordaland were both paid NOK 1.17 million. Solveig Ege Tengesdal of the Christian Democrats party, the County Council leader in Norway’s hard-hit oil county of Rogaland, was paid NOK 1.21 million while Jenny Følling of the Center Party had a salary of NOK 1.07 million as leader of the County Council in Sogn of Fjordane. Government ministers in Norway earn NOK 1.2 million a year, while Members of Parliament earn NOK 906,928. 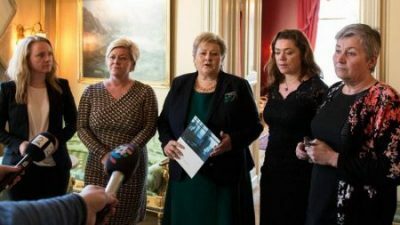 That county leaders’ pay was more than double the average salaries in Norway, and Tengesdal of Rogaland said it was “difficult” to answer whether it was reasonable that she earned as much as a government minister. “It’s a well-paid job,” she admitted to Aftenposten, “but then you have to compare it to comparative leadership jobs in the county.” She also noted that her salary had “come down a little” in the past year. Other county politicians also earn comfortable, if highly variable, salaries, often in addition to what they earn in civilian jobs or other political positions in their home communities. “The pay levels for county politicians is frightening,” claimed Helge Njåstad, a Member of Parliament for the Progress Party and head of the parliament’s committee on local governments. “It’s become too lucrative to be county politician, and it’s not in line with the tasks they have.” Most of the important government services at the local level in Norway are handled through the kommuner (towns and cities), not the fylker (counties). Now it will soon be time for labour and employer organizations in both the private and public sectors to hammer out new wage deals for their employees. The organizations already agree that the time for moderation has not passed, but there may be room for slightly higher raises than those granted in recent years that left workers lagging behind inflation. “There are still big problems in the petroleum industry, with job cuts and layoffs and a downturn in investment,” Kristin Skogen Lund, head of the national employers’ organization NHO told news bureau NTB on Monday, after meeting with top government officials and her counterpart at the country’s biggest trade union confederation LO, Gerd Kristiansen. “That unfortunately means that we are dependent on wage moderation.” Lund claimed that “there’s no basis for pay growth in the Norwegian economy.” Never mind the high executive pay levels, also in the petroleum and offshore industry: Lund pointed only to how Norway earlier could export oil at high price levels and import other goods at low price levels. “That’s not true anymore,” she said.